This simple, yet effective, pattern holds a special place in my fly box because it was the first fly I learned how to tie. 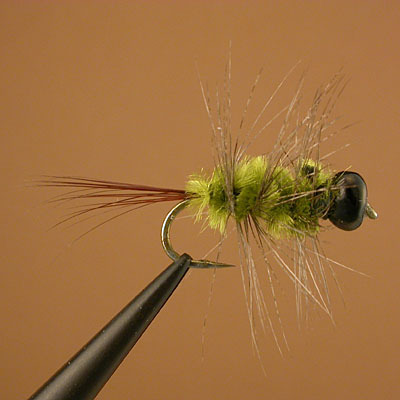 I learned how to tie this fly from an old fly-tying kit I bought on Ebay. This kit had just enough materials in it to teach a beginner how to tie Wooly Worms. The first one of these flies that came off my vise was also the first fly I caught a fish on. I would love to say that first fish was a 14" rainbow trout or a 20" largemouth bass but that would be far from true. The first Green Grub I tied caught a 7" sunfish on the downstream side of Russell Mill Pond in Chelmsford, MA. Since then, this fly has turned into one of my go to flies when I go panfishing. I fish this fly as a nymph, letting it sink to the bottom and then slowly stripping it back to me. This fly has caught sunfish, crappie, largemouth bass, and even a few catfish. The original pattern called for chenille as the body and head material , but I modified it with a beadhead so I could fish the fly down near the bottom without having to add split shot to my leader. I’m not sure what nymph this fly imitates, but like the original Wooly Worm the Green Grub catches a lot of fish.